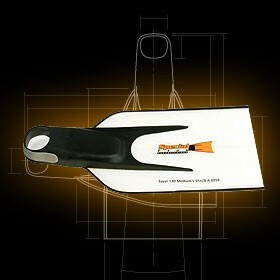 The shape of the fibreglass blade is evenly wide throughout. Most often strongened fin-strap is added, thus the feet is fixed firmer in footpockets, even by strongest kicks. Saver 130 can be produced by your individual measures (max. measures as to ILS competition rules 65 x 30 cm). Fins have rubber ribs and heightened side protection for directing the water flow. Rubber under the sole makes the fins nonslipping in start and by turns. For protection against rubbing and blisters we recommend to use with neoprene socks. Design your Saver 130 yourself - with name & flag they will be unique! Saver 130 fins come with a ONE (1) year warranty for materials and craftsmanship.